Playing on both sides of a cross-state rivalry, JD Hastings has been an important figure for both North Carolina and UNC Wilmington. When J.D. Hastings heard the news that he would be attending UNC Wilmington for grad school, he was still in the midst of the 2016 season, playing for a North Carolina squad that would eventually reach the semis at Nationals for the third straight season and living with fellow Darkside seniors Aaron Warshauer and Dain Nielsen. “Everyone was happy for me on getting into the program, but it definitely opened up opportunities to be trolled,” recalls Hastings. It was hard to imagine Hastings fitting into the UNC Wilmington team culture in order to play during his final year of college eligibility. The bad boys image that Wilmington embraced season after season was fun to watch as an outside observer, but a pain to play against. It was hard to imagine a bubbly, goofy, stocky ex-corner from Wilmington’s bitter cross-state rival joining up with a squad that embraced a wholly different approach to their identity. Needless to say, for almost all of the 2016-17 season, a variety of different people have joked that Hastings is secretly a sleeper agent for UNC, just waiting for the moment when the two teams finally play to destroy Wilmington from the inside. While this still induces a wink and a nod every time it’s uttered, the truth may be that as much as UNC Wilmington needed another experienced thrower to fill in the holes left by the class of 2016, J.D. may have also needed Wilmington. A first look at the Seamen this year suggested that they were going to have a long road ahead. The high-profile loss of Xavier Maxstadt barely addressed the fact that Wilmington also lost their best mid (Erik Esposto), their second main handler (Charlie Lian), a key deep (Matt Mason), and a feisty veteran defender (Jake Gallagher). The team was also amidst a somewhat messy coaching shakeup — long-time coach Greg Vassar had left the team and assistant Brian Casey was elevated to head coaching status. Given the situation surrounding the squad, there was certainly plenty of room for a player like Hastings to fill. Coming into the program with four years of elite experience under his belt, J.D. had a perfect opportunity to not only improve his game under new coaches and with a team that needed more from him, but also to take on a vocal role as a team leader. “In UNC’s system, I was able to to lean on younger players to pick up a disc on a turnover because I just didn’t have the confidence in my throws,” Hastings explained. With Wilmington, rather than support the D-line on a turn, Hastings was called upon to lead it. Back in January, J.D. was still in the process of immersing himself within the program. “I had done a pretty poor job actively seeking ways outside of practice to connect with the guys,” admits Hastings. Instead, Hastings fell back on the relationship he had with Casey, one that was similar to the one he had with UNC’s Jonathan Nethercutt in 2016. That trust would soon be tested, as the tremors left by Wilmington’s roster turnover and coaching shakeup in the fall continued into the spring. In January, the team was temporarily suspended from travel to Carolina Kickoff by their university for a club sports uniform violation. Two weeks later, it became known that head coach Brian Casey had been suspended for ethics violations. It seemed the typical roller coaster that was already in motion for Wilmington. What remained unclear in February was how it would ultimately affect the program as a whole. There has been a significant shift this season in the way Wilmington does just about everything. While part of that comes from having to adjust the on-field strategy to not having a thrower like Xavier Maxstadt, there has been a visible shift in Wilmington’s team culture this year as well. Cultivating buy-in for that was essential for UNC Wilmington’s program to thrive in 2017, and the job of teaching and growing the program passed to the Wilmington captains, and additionally, Hastings. Hastings’ willingness to put his foot forward as another leader helped Wilmington navigate through not having their head coach at their first tournament of the year. 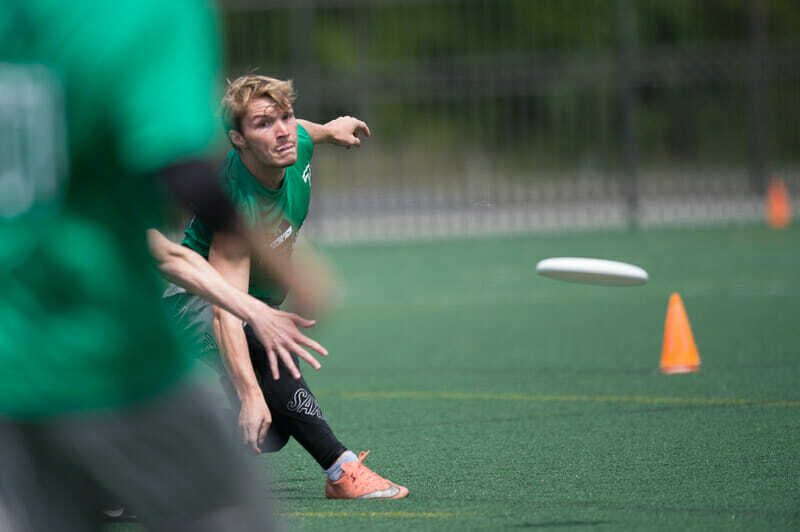 Wilmington performed well in their first spring appearance at Queen City Tune Up, losing to Georgia in the semis, 15-13. The squad looked balanced and capable of holding its own. More critically, the setbacks the team had suffered were barely even noticeable, reflective of the type of leadership Hastings brought with him from North Carolina. It’s not uncommon to see Hastings helping lead Wilmington’s workouts on campus or the beach, still bringing the same joker attitude he’s always possessed. The identity he has helped cultivate this season has begun to chip away at some of Wilmington’s previous reputation and even held firm in the face of heated moments that occurred during the spring. Throughout this season Wilmington has demonstrated more restraint and more focus on the actual game than perhaps any season in recent memory. Perhaps most revealing was an exchange between Wilmington and Wisconsin at Easterns. After a foul call on a block in the endzone, an incredulous Kevin Mateer raised his arms yelling “no way.” Hastings responded in his own way “Just talk to him Kev.” Mateer calmly made his case to the Wisconsin player and the call was resolved. Even in a high-profile rivalry game against Pittsburgh (since 2013, perhaps of the most heated matchup in the division), Wilmington displayed a level-headed performance bolstered by the presence of its ever vocal alumni. It was a clean game that at no point seemed to devolve into the chippiness or emotions that have often characterized the high-profile rivalry. That being said, Hastings’ experiences with Wilmington have certainly brought him closer to his new program and created the kind of leadership dynamic you’d expect from a fifth-year player who’s been a part of the same program the entire time. Wilmington is still Wilmington in the sense that they haven’t quite been able to escape the drama that seems to come with every college season. Where Wilmington has taken a turn — and arguably a turn for the better — is in the way they have constructed their identity, and ultimately, in the way they approach the game. Now, in his last tournament as a college player, Hastings is leading Wilmington in a fight for a Monday appearance at Nationals. They face off against Washington Sunday morning in the quarterfinals — with a potential matchup against UNC looming in the semis. If anyone still wonders is Hastings is on a covert mission to undermine the Seamen for the benefit of Darkside, the way the bracket has shaken out is almost too good to be true. So far this season, Hastings has lived up to his goals with Wilmington. He has worked diligently to not only lead on the field, but to begin to bridge the gap in the reputations between his current and former teams. In so doing, he has helped put UNCW in position to survive a spring of controversy and hopefully achieve their considerable potential. Time to see if his efforts have paid off. Comments on "From Darkside To Seaside"